Of course, one cannot fly to the moon. The earth’s atmosphere extends to about 250 miles from the ground, which is roughly one per cent of the distance to the moon. And only three per cent of the height of the atmosphere is suitable for flying. This fact was realized fairly early, roughly ten or fifteen years after the invention of the balloon in 1783. It is amusing to see that before the invention of the balloon there were many crackpot inventors of flying machines of various kinds, each one of them promising flight at high altitude and great speed, and each one winding up by saying that one might eventually reach even the moon with that machine “to bring plants and animals from there as one now brings monkeys and peacocks from Asia.” After the balloon was invented there were still many crackpot schemes for flying (and a few serious ideas), but nobody promised any more that the moon would be reached. All that was promised then was that “the machine” would be able to fly in the direction desired by its pilot, something that a balloon could not do. Around the middle of the last century the idea began to crop up that one might be able to shoot to the moon. To most people this idea is connected with one name, that of the great French novelist, Jules Verne, who wrote two novels about it, the first of which, From the Earth to the Moon, was printed for the first time in 1865. But Jules Verne did not get his idea out of thin air; there was a little history to it even then. Strangely enough, the shaping of the idea of a moon gun was based on a mistake. Just a few decades before Jules Verne, a German scientist by the name of Chladni had proved that there were actually such things as meteorites. Up to Chladni’s time, learned societies had steadfastly refused to believe that stones could fall from the sky. Chladni collected all the evidence which he could gather which was a lot, and showed that, in spite of the attitude of official academies, meteorites did fall. And Mother Nature herself helped the case along by producing a rather spectacular fall a few years after the book was published. At the same time several astronomers had paid special attention to the surface of the moon and decided that all the little circles that can be seen thereâ€””little circles” up to eighty miles in diameterâ€”were extinct volcanoes. It was easy to combine the two ideas and suggest that the meteorites that fall onto the earth may originally have been material ejected from the volcanoes on the moon. We now know that at least the vast majority of the lunar “craters,” instead of having once ejected meteorites, are, on the contrary, the results of a bombardment with meteorites, of the type of famous Meteor Crater in Arizona. But around 1850 things were believed to have worked the other way round (Meteor Crater was undiscovered then), and mathematicians set out to investigate the case with the means of their own science. The mathematics of the problem worked as follows: If a lunar volcano ejected a stone with an initial velocity of, say, half a mile per second, that stone would climb against the moon’s gravity to a certain height. Then it would fall back, striking the moon’s surface with a velocity of half a mile per second: natural law states that the velocity of impact for a fall from a certain altitude is the same as the velocity of departure required to reach that same altitude. If the stone were ejected with a velocity of a mile per second precisely the same thing would happen, but in the process the stone would reach a much higher altitude than the first, many times as high, in fact, although the velocity were only double. In the case of the moon, that escape velocity amounts to 2,370 meters per second, or 1.47 miles per second; in the case of the earth it amounts to 11,180 meters per second, or almost precisely 7 miles per second. Thus the moon volcanoes (if they were volcanoes) would have to impart a velocity of one and a half miles per second to their stones if they were to fall to the earth. A terrestrial volcano, to bombard the moon, would have to impart a velocity of 7 miles per second to its “bombs,” plus whatever were needed to overcome air resistance. It was here that Jules Verne took up the threads of scientific reasoning to spin his yarn. 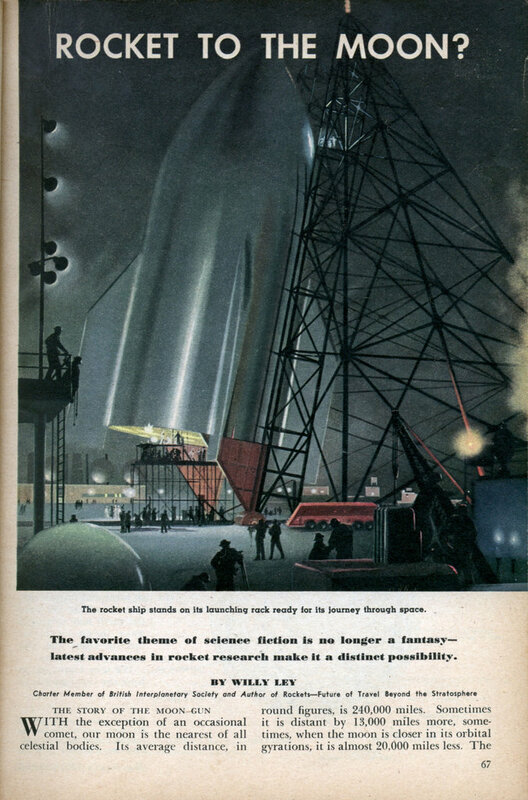 In brief, he said that a fictitious “Gun Club” in Baltimore proposed to build a gigantic cannon in Florida, capable of sending a 9-foot ball to the moon, while simultaneously a new gigantic telescope was to be built which would enable astronomers to see the ball when it got there. The story then gets complicated by the substitution of a hollow shell for the ball and three men volunteering to travel in it. These complications do not interest us here; the question is whether such a gun could be built and whether it would work. The main figures, as given by Jules Verne, are correct. If the projectile left the atmosphere with a velocity of 7 miles per second, it would need 83 hours and 20 minutes to reach the (imaginary) point where the attractions of earth and moon were equally powerful. Just “crawling” across that point (in which, contrary to the assertions of Jules Verne, one could never “get stuck”), the projectile would come into the grip of the moon’s gravitational attraction and fall toward the moon. This would take another 13 hours and 53 minutes, making a total of 97 hours and 13 minutes. It was proposed that the moon gun be 900 feet long, poured into a 900-foot well, so that the metal of the cannon be only the lining of a barrel with walls of indeterminate thickness, the soil of Florida, 400,000 pounds of guncotton (an arbitrary amount) were to be put into the gun, filling the bottom part up to a height of 200 feet so that the useful length left be only 700 feet. This was supposed to produce a muzzle velocity of 54,000 feet per second, of which Jules Verne expected to lose 1/3 to air resistance, so that the projectile would emerge from the atmosphere at 36,000 feet, or about 7 miles, per second. Jules Verne was perfectly well aware that nobody could travel in such a projectile and survive; but if he had been asked whether the gun itself would work, he would probably have said that it might. Actually the projectile would hardly have left the barrel! Verne completely forgot that there is air resistance inside the barrel, too. Above the projectile there is a cylinder of air, 700 feet high and nine feet in diameter. Since the projectile is to move much faster than sound, that air cannot possibly get out of the way; the projectile could not push it out of the barrel; all it could do is to compress it. Since air grows hot when compressed, the projectile would be pushed from below by hot explosion gases and would experience a counter-push from above by highly compressed and very sluggish and at the same time very hot air. The projectile would be between two very hot and very powerful pistons and would most probably be crushed between them and volatilized by the heat. The science of ballistics has progressed considerably since Verne wrote this story, and the question is justified whether we could do better now. Could modern experts design a better moon gun? One that would work, if built? It has been tried, not because anybody seriously wanted to do it, but only to see whether it could be done at all. The main difficulty, of course, is air resistance, both inside the barrel and outside. The first can be remedied by pumping the air from the barrel and closing the muzzle with a lid. Since it would be impossible to pump all air from the barrel the slight remainder would be compressed by the moving projectile and that “cap” of compressed air would push off the lid before the projectile actually reached it. So far everything is fine. Now for the air resistance outside the barrel. The easiest way to avoid a great deal of it would be to pour the cannon into a well dug into the top of a high mountain; then the densest layers of the atmosphere would be below the muzzle. It would help to make the shell very heavy per square inch of cross section, because such shells penetrate air resistance better than others. It should be made of a high-grade steel alloy and be practically solid, if not wholly so. The tentative solutions reads: the shell should have a caliber of 48 inches and a length of 300 inches; the barrel of the cannon must be 3,000 feet long, instead of 900; and must be sunk into a mountain near the equator with the muzzle at least 16,000 feet above sea level. Such a gun might be expected to do what Jules Verne’s fictitious piece was supposed to do: get a projectile safely through the atmosphere with a muzzle velocity great enough to prevent its return. Hardly had these calculations been pub lished when another mathematician, who had actually worked with heavy artillery, stated that he had also toyed with the idea of Jules Verne’s moon gun. He had come to the same general conclusions as the other investigators, except that he had put his muzzle 20,000 feet above sea level. And he had had to do something else: according to his experience, the powder gases generated at the bottom of the deep barrel well would simply not be able to follow the shell fast enough. It would be necessary, therefore, to attach at least one-third of the propelling charge to the shell itself, and to have a number of extra firing chambers along the length of the barrel, leading into it from the sides. Built that way the moon gun might work. But it cannot be predicted whether it could be built. Nor could the cost be predicted, although there is no doubt that it would be enormous. And, finally, nobody could sup ply any valid reason for the expenditure of so much money for an experiment without any practical advantages. But the theoretical investigation of Jules Verne’s moon gun did have a useful result: it pointed to the possibility of using rockets. There are many reasons in favor of such a change to another method of propulsion. Theoretically, any rocket which has grown beyond a certain minimum size and which has a burning time of more than, say, half a minute, is capable of outracing any artillery projectile past, present, or future. V-2 has shown that that theory is correct. Consequently, promises of rocket theory for still higher speeds can be accepted without reservation, even though there are some difficulties. For the present we’ll just keep in mind that the theory promises such higher velocities. At least as important as that promise is the fact that a rocket which goes up vertically for an indefinite distance “will find much less air resistance than a shell. A shell has its highest velocity at the muzzle of the gun; a rocket takes off very slowly and increases its velocity steadily while climbing. Since the air is densest at sea level the shell is at an enormous disadvantage for vertical fire: the air is densest, and air resistance highest, just where the shell is fastest! The rocket, on the other hand, takes off about as fast as an express elevator. At a height of two or three miles it is as fast as a modern pursuit plane. At six or seven miles it has reached the velocity of a rifle bullet, but up there the air is already so thin that the air resistance becomes bearable. When the velocity of the rocket reaches several miles a second, the surrounding air is attenuated to what we would call a vacuum if we had it on the ground and inside a vacuum tube. Even that “vacuum” still offers considerable resistance when you go at the rate of several miles per second, but that resistance is nothing compared to what would be encountered closer to sea level. Besides, you can stretch the whole air resistance question a little more in favor of the rocket if it does not take off from “a lonely island in the Pacific,” meaning sea level, but from a high mountain, so that the densest layers of the atmosphere are beneath it even before the rocket begins to work. young man who wanted (and got) his money back is quite common. The point is that vehicles of any kind, whether floating, rolling or flying, cannot be compared with rockets. All such vehicles accelerate until they reach their top speed and then stop accelerating. A rocket, ascending vertically, accelerates until it is out of fuel. This is a very important difference which sets the rocket apart from anything else in existence. What happens when a rocket charge is ignited is simply that the charge, via combustion, is changed into hot gas under high pressure. Escaping through a specially shaped exhaust nozzle, the gas creates a recoil of the same kind as the recoil of a gun, except that it lasts longer. If the rocket weighs, say ten pounds, and the recoil is twenty pounds, the acceleration is, at first, 1 g, which means that the speed will go up at the rate of 32 feet per second for every second elapsed. Yon can figure out for yourself how the velocity will go up, especially if you have a higher acceleration than 1 g to begin with. And the acceleration will go up later on at any event. The thrust stays the same as long as the charge burns, but as the charge is used up the weight of the rocket decreases. The acceleration, consequently, increases. It can easily be seen now why the amount of fuel is important. The acceleration lasts until all the fuel has been burned. The more fuel, the longer the period of acceleration, the higher the final velocity. But what about the nature of the fuel? How does that come in? The velocity with which the combustion gases escape through the exhaust nozzle is called “exhaust velocity.” In actual tests it has been found to range all the way from 2,000 feet per second to about 7,000 feet per second, depending on the nature of the fuel. The lower figure refers to ordinary rocket powder as it is used in skyrockets, the higher to light fuel oil burned with liquid oxygen. It is this exhaust velocity which determines the thrust and, consequently, the acceleration, while the fuel supply determines the duration of acceleration. Now we can go back to the problem of the moon rocket. Obviously it is just a question of having a sufficiently powerful fuel (meaning the one with the highest exhaust velocity), and enough of it. The velocity to be attained is seven miles per second at the fringe of our atmosphere. What fuel should we use and how much of it would we need for that? The most powerful chemical fuel known at present is hydrogen burned with liquefied ozone, but there are important engineering difficulties to be overcome. These difficulties have been solved for the somewhat less powerful gasoline burned with liquid oxygen, delivering an exhaust velocity that might be forced up to 8,000 feet per second. There exists a mathematical law that can be questioned on that score. It states that the “mass-ratio” (which is the ratio between the fully fuelled and the empty rocket) has to be 2.72 to 1 if the velocity of the rocket is to be equal to its own exhaust velocity. That, of course, holds true for any exhaust velocity. In our case, with about 8,000 ft. p. sec. at our disposal, such a mass-ratio is far too low; 8,000 ft. p. sec. is only about 1-1/2 miles, and we need seven. If the rocket is to attain twice the velocity of its own exhaust, the mass-ratio has to be the square of 2.72; if it is to go three times as fast, the mass-ratio is to be the cube of 2.72, which is about 20.1. So far not even 3,000 yards per second have been attained. That figure will have to be doubled before one could even seriously think about making the experiment. Then it might be tried; by having a larger rocket carrying a smaller one part of the way, a mass-ratio of 26 to 1 (26 pounds of take-off weight for every pound that gets to the moon) might be accomplished. At first glance the result of this rocket discussion may look as disappointing as the result of the gun discussion in the preceding article. But there is an enormous difference. The gun discussion ended up with the realization that it was simply impossible to build such a gun, that no trick of advanced engineering and no amount of experimentation could help. In the rocket discussion we arrived at some definite figures. Find a fuel that has an exhaust velocity of about 5,500 yards per second and then find a way of building a rocket with a mass-ratio of 26 to 1. Or the other way round, find the way of building such a rocket first and then go about finding such a fuel. As for the fuel, hydrogen with liquid ozone may turn the trick. As for the design, a combination of two rockets may be expected to produce such a mass-ratio. To sum up: while the rocket to the moon cannot be accomplished now, we know in which direction engineering research will have to progress to make it possible later. The requirements are high, but not impossible, and they are likely to be met before most of us who read this now have time to die of old age. In considering the dangers of space travel by rocket, we shall have to content ourselves with those which we know to exist; others may be present, but we have no way of determining them now. One known danger comes from the short radiations, ultra-violet and shorter, of the sun and meteorites. The metal hull of the ship will protect the crew from all the short radiations. The weak points are the windows. It is significant that all the “early” books about the problem, those written between 1925 and 1930, are evasive about that question. I was once asked about it after a lecture and I had to reply that one would have to wait for favorable developments in that respect. In the meantime these favorable developments have taken place. High-altitude flying has taught a number of valuable lessons and has stimulated chemical research to solve the problem. In the first place, glass has been replaced by transparent plastics which are far superior mechanically. But the customary transparent plastics list it as one of their advantages that they do not shut out ultraviolet rays. This is an advantage at and near sea level, where the dosage is small. But in high altitudes, where the thickest part of the atmospheric blanket is lacking, there is far too much ultra-violet for good health. It did not take long, after this was realized, to develop a special type of transparent plastic which is almost opaque to ultra-violet without impeding the passage of visible radiations. For use in open space even this new compound is not opaque enough, but the quick, partial solution of the problem indicates that a full solution is possible. The danger from meteorites is far more substantial and cannot be combatted in so easy a manner as the ultra-violet. In fact there is little that can be clone about meteorites at all. Detection of a large meteorite might be possible by a radar-type instrument, but it would probably miss the small and much more numerous meteorites. Even if the instrument did not miss them, the detection would not be of any help. Detection does not mean that the orbit of the meteorite has been established. It would be a major job to find out whether the orbits of the meteorite and of the ship intersect at a point where both will be at the same time. No doubt there is a danger factor there and all we can do is to estimate the probable frequency of such an event. The earth, astronomers estimate, is hit by some two million meteorites every twenty-four hours. The vast majority of them burn up in the atmosphere; an average of two out of the two million reach the ground. To a spaceship, even the small ones would constitute a danger, but that figure cannot be applied to a spaceship as some critical authors have done in the past. The earth presents a target several thousand billion limes as large as the largest conceivable ship. And although most meteorites do not so much fall onto the earth as they run into it or the earth runs into them, the gravity of our planet plays a role too. This second factor is missing completely in the case of a ship. The figure given for the earth is therefore, only misleading and should be discarded. But another way of estimating the danger can be tried. Making some unfavorable assumptions, one can calculate that we would have to send about five hundred thousand rockets around the moon to be sure that one of them would be hit by a meteorite. The danger factor, it may safely be concluded, is quite small. However, it does exist, and it is the only danger that is not due mostly to the imagination. But since when do we live in an age where no ship is ever wrecked in a storm, no railroad train ever suffers an accident, and no airplane ever crashes? If a meteorite did hit the passenger cabin of a ship, it would pass through the metal wallsâ€”probably consisting of an aluminum-beryllium alloyâ€”as easily as a high velocity rifle bullet passes through an empty cardboard box. Still this does not necessarily mean the death of the whole crew. Because of its rapid passage, the meteorite would produce two holes of exactly the same size as its own diameter. Naturally the air would escape through these holes, but it would not happen instantaneously. In fact the drop in air pressure would be the first warning sign. Now we get into a whole complex of questions. The mechanical part is relatively simple. “Bends” is caused by rapid decompression of any description, but the real cause may be described as “bubbles in the blood,” nitrogen bubbles, to be precise. The nitrogen of the atmosphere has the habit of dissolving in the tissues and in the blood. As long as the pressure stays normal this saturation with nitrogen is of no consequence whatever. But when the pressure is released, or better, relaxed, the nitrogen emerges and forms the dangerous bubbles constituting the cause of the bends. Elaborate tests have shown that the bends might be avoided if the body is saturated with oxygen for a period of time before the decompression occurs. Unfortunately the “period of time” is long, at least five hours, and breathing too much oxygen is not at all healthy, either. But there exists another and better substitute for nitrogen: helium. – Helium, chemically even more inert than nitrogen, does dissolve in the body to a certain extent, but it is much less soluble than oxygen, roughly one-fifth. Conversely, the process of bubble formation under decompression is much milder; in fact it needs an extreme case to occur to a health-impairing extent. Diving tests with rapid ascent have shown that experienced divers at least, emerging in a helium-oxygen atmosphere, can sustain decompressions which would have killed them if the atmosphere had been a nitrogen-oxygen mixture. It becomes clear, then, that the atmosphere inside a spaceship cabin should be a helium-oxygen instead of a nitrogen-oxygen mixture. This again is a point where recent developments evolved for high-altitude flying permit us to say more than could be said ten years ago. Supposing the meteorite which pierced the cabin were very small, so that the holes it made were like pinpricks? Air would escape slowly through these holes and the decompression would be so slight that it might pass unnoticed for a long time. A great deal of oxygen atmosphere could be lost in this way. This is where I screwed up and got confused. This second article “Rocket Travel Through Space” starts right in the middle of the other one and I scanned that instead. I’m not sure where the magazine is so I guess we’ll have to make due. THE British Interplanetary Society was founded in 1933 with the express aim of promoting and facilitating research into all problems associated with space travel. The research program up till the time of the war consisted of detailed theoretical study of a test case: the requirements of a vessel capable of transporting a scientific expedition to the moon, with provision for its return; the design and construction of demonstration models of navigational instruments for special purposes; and experimental examination of fuel combinations. Up to now, much of the Society’s work has been in original research and in the analysis of experiments made during early rocket testsâ€”the work of Opel and his car, of Professor Oberth, Mr. Pendray, Grindell-Matthews, and of that very brilliant authority, P. E. Cleator. Opel, by the way, was well known in Britain for his 100 m.p.h, rocket-driven car demonstrated near Berlin in 1928. In an early experiment with a car resting upon rails, a cat took the place of the driver, but after a journey of approximately three quarters of a mile, most of the powder-charged rockets ignited simultaneously. The car, the rails, the cat and quite a large quantity of earth have not yet been found! Among early experiments in Britain a rocket was fired from the mainland in an attempt to carry mails to the Isle of Wightâ€”a distance of only a few miles. The rocket, however, acted like the first robot; it flew back towards the more venturesome onlookers, and virtually exploded before it reached the ground to strew its letters like leaves before the gale. The failure was due to poor fuel. Rocket fuel has been the subject of innumerable tests. The liquid oxygen and hydrocarbon type is by no means new, but only recently has liquid oxygen become commercial. It may yet give us the clue to many new explosives and, more important, to entirely different methods of high-speed travel. Most of these original oxygen experiments were made with gasoline, but this was discarded during the early experiments made by the German Rocket Society in favor of alcohol which can, of course, be mixed with oxygen without difficulty. The first powdered fuel tests, using tubes packed with gunpowder, were largely unsuccessful, which perhaps accounts for the failure to realize that the original work by these rocket societies is responsible to a great extent for the present-day military rocket-shell. the halfway distance between earth and moon would be under conditions of “no gravity.” It has already been proposed that a slight rotary motion should be given to the ship in order that centrifugal force may enable the occupants to live without magnetic shoes or other queer accessories. The difficulties of excessive heat from the sun’s rays are probably easily overcome by the use of reflecting surfaces, while the hitherto insuperable difficulty of starting at rest to reach a possible speed of 25,000 miles per hour in eight minutes has now been found to be far less serious than was originally thought. Tests have been made in Germany by means of centrifugal machines which demonstrated that this acceleration can comfortably be withstood by human beings, and further detailed observations and plottings have proved that the greatest danger of all, that of meteorites, is likely to be less troublesome than the risk of crossing an ordinary roadway. The insurance rates would only approximate one in one million. Military rockets can be of immense value in peace-time. They will help us to learn about high-speed flying, they could be used for postal work, and as an immediate outlet they can tell us more about the upper atmosphere, or stratosphere, than has been learned during the past half-century. By a detailed and accurate knowledge of the lower stratosphere we may be able to forecast weather for many weeks ahead, information which would change meteorology from guesswork to a useful and proper science. The world at present knows next to nothing about cosmic rays. The rocket may take its place with the cathode ray microscope as one of the most important “weapons” the physicist has ever possessed. The steam helicopter on page 72 looks remarkably like what I saw on the Discovery channel. The lift rotor was spun by small ramjets at the tips, with no need of a tail rotor. In the video I saw the body of the craft was barely larger than a go-cart. When were the V-2s de-secretized? I suppose the Allies came across several of them in the first months after D-Day. and one of his “Stars and Stripes” newsmagazines described the V-1 and maybe the V-2. How well did the BIS moonship compare to the Saturn V? This is a key article in the history of spaceflight. What a delight to be able to see it for myself! The bottles are big and clumsy, weighing around sixty pounds apiece, and each holds only about five mass pounds of air even at that enormous pressure; instead of a month’s supply you will have only a few hours — my suit was rated at eight hours for the bottles it used to have. But you will be okay for those hours — if everything works right. You can stretch time, for you don’t die from overheating very fast and can stand too much carbon dioxide even longer — but let your oxygen run out and you die in about seven minutes. Which gets us back where we started — it takes oxygen to stay alive. To make darn sure that you’re getting enough (your nose can’t tell) you clip a little photoelectric cell to your ear and let it see the color of your blood; the redness of the blood measures the oxygen it carries. Hook this to a galvanometer. If its needle gets into the danger zone, start saying your prayers. 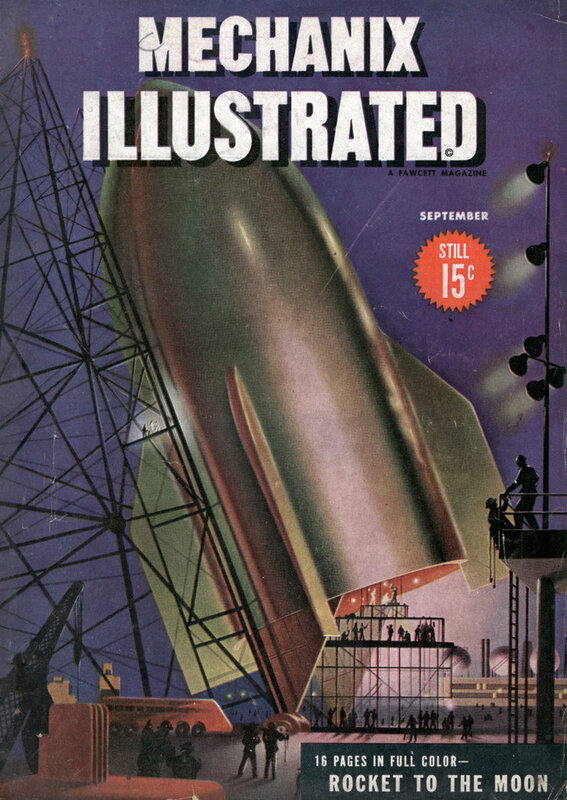 Chesley Bonestell was a meticulous artist. He was known for researching a topic extensively before producing a work of art. Yet many of the drawings here appear to be markedly inaccurate. Are we sure this is Bonestell? Image 12 contradicts the text. There we see an eclipse of the Sun by the Earth in which the Earth is shown as appearing smaller than the Sun. Yet in reality a viewer on the Moon would see the Earth as being much larger than the Sun. An eclipse would be very different – the inner corona would not be visible as above, but the outer corona would be. Now I wouldn’t expect someone in 1945 to realize that the coronas would appear different, but I’d expect them to know that the Earth would appear larger than the Sun from the Moon. The article even states that the Earth looks larger from the Moon than the Moon does from Earth – since the Sun and Moon are of similar apparent size from Earth, one could extrapolate. The drawing on page 9 may or may not be incorrect depending on the artist’s intentions. It features a globe at the horizon, which might be his interpretation of what the Earth would look like from the Moon (and given that nobody had actually been in space yet and the artist would be working in a knowledge vacuum, it’s plausible). Yet the lack of features makes me wonder if it’s supposed to be the Sun, and if so why is the light coming from behind the viewer? There are also some discrepancies, although far more understandable, with respect to the view of Earth from space. Clouds simply don’t look like that – the drawings in images 5 and 13 show random puffy clouds, some in long, parallel lines, with no signs of high or low pressure systems, fronts, or cumulonimbus clouds. It’s possible that meteorologists didn’t realize at that time exactly what weather systems looked like from above, though. Jayessell is mistaken. Images 10 & 11 are from the Lang movie, but the cover and first image are not. Compare the fins, which have a distinctive boxy structure on the movie rocket. Yes, we are. Image 14 clearly states that the color images are his work in collaboration with Ley, which also makes their connection with the Fritz Lang movie exceedingly unlikely. Pedantry aside though, thanks for the gorgeous scans of a truly historic article. how much oxygen will you need on a rocket to last a day? NASA list an average of 15 litres per hour at 1 atmosphere so about 360 litres per day. Two cubic metres (about the smallest comfortable size for an adult human) with 21% oxygen would contain about 420 litres of oxygen. For normal absorption the oxygen level needs to be above 17% so there is about 80 litres of usable oxygen or about 5 hours and 20 minutes worth . The problem is not the amount of oxygen but the build up of CO2. Concentrations of CO2 above 0.5% are considered unhealthy, above 3% dangerous, above 5% deadly, normal atmospheric CO2 is about 0.03%. On average a person exhales about 15 litres of CO2 per hour so in about 40 minutes your cabin would have an unhealthy amount of CO2 and in a little over 3 hours it would be deadly. This is all assuming that activity is limited. Wow JM, that is just about the most informative, helpful response I’ve seen. Thanks!